The US/Saudi war on Yemen is now in its third year, and the indiscriminate Saudi bombing campaign has destroyed much of the country’s infrastructure, left thousands dead and millions starving in a man-made famine, and triggered a cholera epidemic that has infected almost half a million people. On July 23, the International Committee of the Red Cross warned that more than 600,000 people were expected to contract cholera in Yemen this year. Most Americans are not aware of their country’s role in this war on the Middle East’s poorest country, but the Yemenis know very well that Washington supplies the weapons and sponsors the Saudi bombing campaign responsible for their suffering. 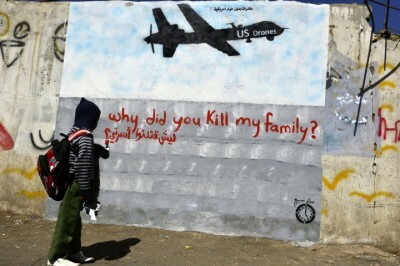 In the capital Sanaa, anti-American graffiti are plastered on walls throughout the city screaming “USA kills Yemeni people,” and they see the war as not just as a Saudi war, but as a US war on their country. On July 19, the US Public Broadcasting Service program Frontline aired a brief documentary titled “Inside Yemen” to look at the impact of the war on the country. In May, a few days after the PBS crew arrived, there was a large demonstration in Sanaa called “Say No to American Terrorism”. The crew captured powerful images of people condemning US aggression against their country. Amazing footage of the enormous "No to American Terrorism on Yemen" rally in the capital Sanaa in May. According to the documentary, the rally was in response to the arrival of US President Donald Trump in Riyadh, where he announced his intention to approve a US$110 billion arms package for the Saudis to continue their bombing campaign. Saudi forces have targeted farms, food facilities, water infrastructure, marketplaces, and even the port of Hudaydah, where most of the humanitarian aid had been entering the country, and the Yemenis just want an end to the slaughter and destruction of their country. Nearly 19 million people require assistance, with 7 million facing famine. The PBS crew noted that although the Yemenis could clearly see they were Americans, there was no hostility, as the population placed the blame not on them but on the US government. One protester explained that he respected America, but the purpose of the rally was “to express our outrage against the United States policy”. Ordinary Yemenis just wanted the world to be aware of what is actually going on in their country. Their cries have not gone unheeded. Some members of the US Congress have been actively shedding light on their country’s complicity in this humanitarian disaster, spearheaded by Republican Senator Rand Paul, Democratic Senator Chris Murphy, and Ted Lieu, a Democratic congressman from California. On June 13, the Senate voted on a bipartisan bill to halt a new $510 million arms package to Saudi Arabia, but it was defeated by a narrow margin of 53-47. Despite the loss, the vote reflected an increasing level of Senate opposition to Saudi arms sales, compared with a similar measure in September last year that failed 71-27. Back in September, while some members of Congress were convinced about their reasons for dissent, it seemed that the senators who approved the arms package were ignorant about what they were rubber-stamping or even knew much about Yemen. For example, when asked why they voted against blocking the deal, some senators cited concern that the Strait of Hormuz would be threatened if Houthi rebels took over Yemen, apparently confusing Oman with Yemen. The Strait of Hormuz actually separates Iran and the Omani Peninsula, whereas Yemen is hundreds of kilometers to the southwest and borders the Red Sea and the Gulf of Aden. Meanwhile, Rand Paul railed against senators “talking about making a buck while 17 million people are threatened with famine”. Lieu, who since August 2016 has been protesting against US complicity in Saudi war crimes, also recently issued a statement on the House of Representatives’ passage of his amendment to the National Defense Authorization Act for fiscal year 2018. The Lieu amendment requires the Pentagon to report to Congress on whether Riyadh and coalition partners are abiding by their commitments in Yemen, and on July 14 the House finally voted to defund US military support for the Saudi war on Yemen. However, Yemen continues to collapse under the non-stop Saudi aerial bombardment, with Riyadh blocking access by journalists and humanitarian organizations. Jamie McGoldrick, the United Nations humanitarian coordinator in Yemen, has warned that because of the lack of media coverage the UN had been unable to raise even 30% of the funding it needs to deal with the crisis. While the devastation and famine in Yemen have been largely ignored in the US press, the British Broadcasting Corporation on September 22, 2016, published an article and video that provided a small peek into the human misery and suffering, especially of Yemeni children. Dr. Christina Lin is a Nonresident Fellow at the Center for Transatlantic Relations at SAIS-Johns Hopkins University specializing in China-Middle East/Mediterranean relations, and a research consultant for Jane’s Chemical, Biological, Radiological, and Nuclear Intelligence Centre at IHS Markit.